Yes, we will be doing another BarCamp in Milwaukee, and yes, it will be the first weekend in October, though we’re only doing one day this time, so join us Saturday, October 5th, 2013 at Bucketworks “Summer Camp”, located at 161 W Wisconsin Ave, 2nd Floor, right above TJ Maxx in the Grand Avenue Mall. Show up around 9am, and we will wrap it up by 9pm. In-between it will be the usual user generated conference wherein we figure everything out the day of the event. Who will be speaking? What will they speak about? We don’t know… but we will figure it all out on the 5th. Think of it as an “idea swap meet” where you share your knowledge and thoughts, and others do the same. You will leave with new things in your head, and maybe even some new friends or partners in crime. We’re going all retro by doing as little planning as possible, but if you would be so kind as to register at barcampmilwaukee.org we would love that. Also, bring some lunch money. There is a food court. Hey, it’s not like were asking you to bring your own chair! (Yes, we did that before.) It’s not like were asking you to bring your own utensils! (Yes, we did that too.) Oh, we may be able to provide parking for cheap. Would you pay $5 to park all day for this free event? Let us know on Atrium, or elsewhere, somehow. It’s all so… undefined. Exciting, isn’t it!?!? 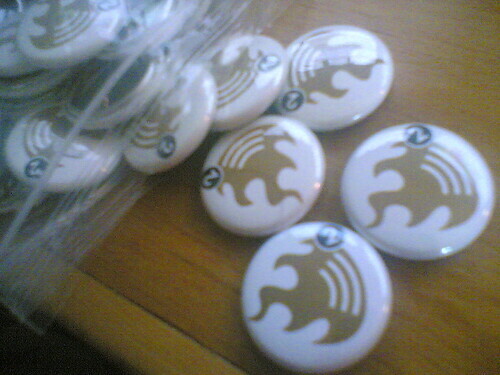 Whew, check it out… it’s nearly time for BarCampMilwaukee6! I’m sure a lot will happen before then, but there’s already a lot that’s happened in the last few months. So I’d like to take this chance, before BarCamp even happens, to thank the people who got us this far. And all of these people! Remember when you first heard about BarCamp? 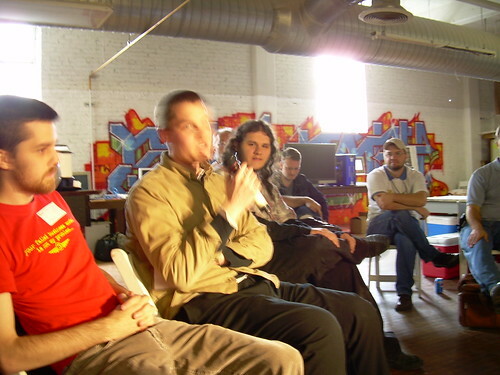 In case you forgot, the first BarCamp was held in Palo Alto, California, from August 19–21, 2005. Good old Wikipedia has a BarCamp page we’ve pointed many people to. 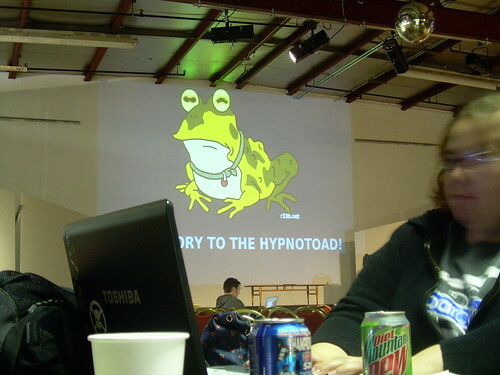 So in 2006 I found myself in need of some networking, and community, and so on, and ended up going to the Milwaukee Web Design Meetup in May and June of 2006, and just after that, I wrote a blog post titled BarCampMilwaukee? Which, unless anyone wants to dispute, may have been the first seed of the tree that grew to be what we now know as the mighty oak that is… BarCampMilwaukee. Lots of people helped along the way, including Justin Kruger, who ended up finding James Carlson and Bucketworks, which ended up being the venue for the first BarCampMilwaukee. Bucketworks also hosted the third and fifth BarCampMilwaukee, and for the second and forth, we were unable to use their building (moving, floods, occupancy issues, etc.) they got us venues to use. Bucketworks also acted as the fiscal sponsor for BarCampMilwaukee, allowing us to operate as a non-profit organization. In my opinion, Bucketworks (and their parent organization, The School Factory) have been more than just a venue over the years, they’ve been a great partner and a significant reason why BarCamp happens here in Milwaukee. Bucketworks has had its share of ups and downs, and they ain’t perfect, and they don’t always get everything right, but for six years now, they’ve been a part of the BarCampMilwaukee experience. With BarCampMilwaukee6 coming up, it’s nice to know we have a solid venue with tables, chairs, an Internet connection, WiFi, a kitchen, lots and lots of space, and the things (and people!) we need to put on a user-generated conference. So, BarCampMilwaukee6? Yup, it’s happening October 1st-2nd, 2011 at Bucketworks in Milwaukee, Wisconsin. 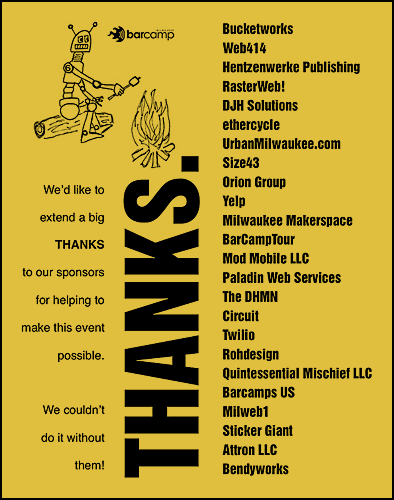 I just renewed barcampmilwaukee.org and at some point the updates will start flowing, and shirts will be made, and meals will be planned, and we’ll do it all again, for the sixth time. Update: I mentioned Justin above, but I also should have mentioned Bob Waldron! Take a look at his blog posts from July 2006 and you’ll see that he and Justin were sort of running parallel to my initiative, and once we found each other and joined forces, things started to happen. Thanks Bob! You want details? Sure… At BarCampMilwaukee4 Sam Dodge and I set up a “Creative Commons Photo Studio” and tried to get portraits of everyone there, with the hope of (a) documenting all the people at the event and (b) providing icon/avatar images for anyone who wanted/needed one. It was a lot of fun for us, as we like taking photos, and we did it quick, quick, quick! We typically grabbed people, took one or two shots, and sent them on their way. We shot with my Nikon D40 with an old manual 50mm prime lens. It was all manual focus, so some are a little softer than I would like, but hey, I think they turned out ok. We had two speedlights with umbrellas, one off to the right up high, and one to the left sort of low… Here’s the set up as seen by the person being shot. Now here’s the bad new…. I somehow lost a bunch of photos. :( I swear I had them all copied and backed up, but somehow, there’s like 30 of them missing. I believe I can recover some from my memory cards, but I’m at a loss to find all of them. 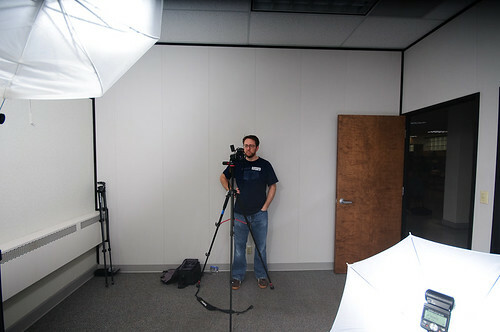 For this, I do apologize, and the only good news I can come up with is that I’m sure we’ll do this again at another event, so keep an eye out for the traveling “Creative Commons Photo Studio” soon! Also, you should feel free to take the photo of yourself, and use it in any way you so desire, and you are granted full permission to do so… so don’t feel bound by the Creative Commons license it is published under. If you want details on all of this, just ask… And thanks for letting us take your picture!